Madjedbebe (formerly known as Malakunanja II) is a sandstone rockshelter in Arnhem Land, in the Northern Territory of Australia. It is located about 50 km from the coast, in the Traditional Lands of the Mirarr people. Although it is surrounded by the World Heritage Listed Kakadu National Park, Madjedbebe itself is located within the Jabiluka Mineral Leasehold. Archaeological excavations have led researchers to suggest that Madjedbebe was first occupied by humans around 65,000 (at least 59.3 thousand) years ago. 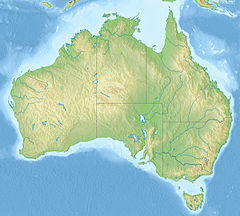 This is the oldest known site showing the presence of humans in Australia. This date sets a new minimum age for the arrival of humans in Australia, the dispersal of modern humans out of Africa and the subsequent interactions of modern humans with Neanderthals and Denisovans. More than 10,000 artefacts have been excavated from the shelter, including flaked stone artefacts, ground stone artefacts, animal bones, shellfish remains, fragments of ground ochre, charcoal, seeds and human burials. Some of these were buried more than 2.5 metres below the surface. Archaeobotanical investigations have demonstrated a clear exploitation of plant foods, including: seeds, tubers and pandanus nuts. Fuel wood was also sourced from a local eucalyptus and moonson vine thicket forest. The Madjedbebe site was first documented by researchers in the 1970s as part of the Alligator Rivers Environmental Fact Finding Study (of course, Mirarr people had always known about the existence of the site). In 1973 archaeologist Johan Kamminga carried out a small-scale test pit excavation to a depth of nearly 2.5 m below surface, which provided the first evidence that the site contained a Pleistocene-aged occupation history. The uppermost 60 cm of the site was rich shell midden, with abundant shells, faunal remains, stone artefacts and human remains. Below this the site was very sandy and contained mostly stone artefacts. In 1988 the site was re-visited by archaeologists Rhys Jones and Christopher Chippindale, along with geochronologist Richard 'Bert' Roberts. At this time they augered a single core at the site in order to trial the then new technique of thermoluminescence dating at the site. The following year, Jones and Roberts returned to the site with archaeologist Mike Smith and excavated another test-pit adjacent to that of Kamminga. The TL age estimates they obtained suggested the site was about 50,000 years old. These ages were queried at the time (and later) on various grounds by numerous researchers, but Roberts et al. responded to the queries re-affirming their confidence in the dates. In 2012 and 2015 a team of researchers, led by Christopher Clarkson and working in partnership with Gundjeihmi Aboriginal Corporation, re-excavated the site to try and dispel the questions about the antiquity of the site. Although the recent results published by Clarkson and his team have led to a series of responses, again with some questioning the integrity of the site stratigraphy and validity of the ages of human occupation, Clarkson's team stands by the dates. Although it is best known as Australia's oldest archaeological site, Madjedbebe also includes an extensive assemblage of rock art motifs on the walls. In 2012 a research team from the Australian National University systematically documented the rock art at the site, under the auspices of the Mirarr Gunwarddebim Project. The team recorded more than 1000 motifs at the site. As many of the images are faded, and many overlap, this is the minimum number of motifs the site that can be seen today; no doubt in the past there were many hundreds more present that no longer survive. The Madjedbebe motifs are mostly paintings (created using wet paint), but there are also some stencils (where a negative image is created by spraying wet paint around the outside of an object held up against the wall), drawings (created by dragging a piece of dry ochre or charcoal across the wall) and beeswax figures (created by applying small, rolled up pieces of beeswax to the wall surface). A variety of different coloured pigments have been used to create the art at Madjedbebe. These are mostly ochres (red, yellow and orange), but many are also white clay (kaolinite) and some black charcoal. Rock art is highly significant for the Mirarr people. The same image can convey different meanings to different people, depending on their cultural standing. The Madjedbebe motifs include many human-like figures ('anthropomorphs'), geometric designs, hand stencils, fish (including catfish, barramundi, freshwater long-tom, mullet and saratoga), fibre objects, and objects from the 'European-contact period'. The latter include firearms, European people (wearing clothing, hats and standing in a characteristic 'hands on hip' manner), pipes, knives and ships. There are no absolute ages for any of the rock art motifs at Madjedbebe. Instead, the art has been dating used relative techniques. This suggests that the majority of the art presented today was created in the last 1500 years, though some motifs may be several thousand years old. It is highly likely that the tradition of painting in the site is far older than this, with older paintings having faded away or been painted over. Of relevance here are the fragments of ochre recovered from the lowest occupation levels during the 2012 and 2015 excavations at Madjedbebe, some of which have ground facets. These are a tantalising suggestion that even at this early time people were engaging in some form of artistic pursuit, whether that was painting motifs on the walls of the shelter, or decorating objects or themselves with the ground ochre. ^ Clarkson, Chris; Smith, Mike; Marwick, Ben; Fullagar, Richard; Wallis, Lynley A.; Faulkner, Patrick; Manne, Tiina; Hayes, Elspeth; Roberts, Richard G.; Jacobs, Zenobia; Carah, Xavier; Lowe, Kelsey M.; Matthews, Jacqueline; Florin, S. Anna (June 2015). "The archaeology, chronology and stratigraphy of Madjedbebe (Malakunanja II): A site in northern Australia with early occupation". Journal of Human Evolution. 83: 46–64. doi:10.1016/j.jhevol.2015.03.014. PMID 25957653. ^ a b c Chris Clarkson; Zenobia Jacobs; Ben Marwick; Richard Fullagar; Lynley Wallis; Mike Smith; Richard G. Roberts; Elspeth Hayes; Kelsey Lowe; Xavier Carah; S. Anna Florin; Jessica McNeil; Delyth Cox; Lee J. Arnold; Quan Hua; Jillian Huntley; Helen E. A. Brand; Tiina Manne; Andrew Fairbairn; James Shulmeister; Lindsey Lyle; Makiah Salinas; Mara Page; Kate Connell; Gayoung Park; Kasih Norman; Tessa Murphy; Colin Pardoe (2017). "Human occupation of northern Australia by 65,000 years ago". Nature. 547 (7663): 306–310. doi:10.1038/nature22968. PMID 28726833. ^ a b Roberts, Richard G.; Jones, Rhys; Smith, M. A. (May 1990). "Thermoluminescence dating of a 50,000-year-old human occupation site in northern Australia". Nature. 345 (6271): 153–156. doi:10.1038/345153a0. ISSN 0028-0836. ^ McNeil, J. 2016 Demonstrating the Stratigraphic Integrity of Madjedbebe: An Analysis of Silcrete Lithic Artefacts. Unpublished BA(Hons) thesis, School of Social Science, University of Queensland, St Lucia. ^ Hayes, E. 2015 What Was Ground? A Functional Analysis of Grinding Stones from Madjedbebe and Lake Mungo, Australia. Unpublished PhD thesis, Centre for Archaeological Science, School of Earth and Environmental Sciences, University of Wollongong, Wollongong. ^ Cox, D. 2013 Haematite 'Crayons' at Madjedbebe: Drawing Conclusions of Cognitive Modernity. Unpublished BA(Hons) thesis, School of Social Science, University of Queensland, St Lucia. ^ Carah, X. 2017 Regime Change: An Anthracological Assessment of Fuel Selection and Management at Madjedbebe (Malakunanja II), Mirarr Country, Australia. Unpublished PhD thesis, School of Social Sciene, University of Queensland, St Lucia. ^ Lowe, Kelsey M.; Wallis, Lynley A.; Pardoe, Colin; Marwick, Ben; Clarkson, Chris; Manne, Tiina; Smith, Mike A.; Fullagar, Richard (11 September 2014). "Ground-penetrating radar and burial practices in western Arnhem Land, Australia". Archaeology in Oceania. 49 (3): 148–157. doi:10.1002/arco.5039. ISSN 0728-4896. ^ Florin, S.A. 2013 Archaeobotanical Investigations into Plant Food Use at Madjedbebe (Malakunanja II). Unpublished BA(Hons) thesis, School of Social Science, University of Queensland, St Lucia. ^ Kamminga, J. and H. Allen 1973 Report of the Archaeological Survey: Alligator Rivers Environmental Fact-Finding Study. Darwin: Government Printer. ^ Hiscock, Peter (October 1990). "How old are the artefacts in Malakunanja II?". Archaeology in Oceania. 25 (3): 122–124. doi:10.1002/j.1834-4453.1990.tb00242.x. ISSN 0728-4896. ^ Bowdler, Sandra; Roberts, Richard; Jones, Rhys; smith, M.A. ; Murray, Tim (January 1990). "backfill". Australian Archaeology. 31 (1): 93–102. doi:10.1080/03122417.1990.11681394. ISSN 0312-2417. ^ Allen, Jim; O’Connell, James (January 2003). "The long and the short of it: Archaeological approaches to determining when humans first colonised Australia and New Guinea". Australian Archaeology. 57 (1): 5–19. doi:10.1080/03122417.2003.11681758. ISSN 0312-2417. ^ Bowdler, Sandra (January 1991). "Some Sort Of Dates At Malakunanja II: A Reply To Roberts Et Al". Australian Archaeology. 32 (1): 50–51. doi:10.1080/03122417.1991.11681414. ISSN 0312-2417. ^ Roberts, Richard G.; Jones, Rhys; Smith, M.A. (October 1990). "Stratigraphy and statistics at Malakunanja II: reply to Hiscock". Archaeology in Oceania. 25 (3): 125–129. doi:10.1002/j.1834-4453.1990.tb00243.x. ISSN 0728-4896. ^ Roberts, Richard; Bird, Michael; Olley, Jon; Galbraith, Rex; Lawson, Ewan; Laslett, Geoff; Yoshida, Hiroyuki; Jones, Rhys; Fullagar, Richard (May 1998). "Optical and radiocarbon dating at Jinmium rock shelter in northern Australia". Nature. 393 (6683): 358–362. doi:10.1038/30718. ISSN 0028-0836. ^ Wood, Rachel (2017-09-02). "Comments on the chronology of Madjedbebe". Australian Archaeology. 83 (3): 172–174. doi:10.1080/03122417.2017.1408545. ISSN 0312-2417. ^ Veth, Peter (2017-09-02). "Breaking through the radiocarbon barrier: Madjedbebe and the new chronology for Aboriginal occupation of Australia". Australian Archaeology. 83 (3): 165–167. doi:10.1080/03122417.2017.1408543. ISSN 0312-2417. ^ Hiscock, Peter (2017-09-02). "Discovery curves, colonisation and Madjedbebe". Australian Archaeology. 83 (3): 168–171. doi:10.1080/03122417.2017.1408544. ISSN 0312-2417. ^ Dortch, Joe; Malaspinas, Anna-Sapfo (2017-09-02). "Madjedbebe and genomic histories of Aboriginal Australia". Australian Archaeology. 83 (3): 174–177. doi:10.1080/03122417.2017.1408546. ISSN 0312-2417. ^ O’Connell, James F.; Allen, Jim; Williams, Martin A. J.; Williams, Alan N.; Turney, Chris S. M.; Spooner, Nigel A.; Kamminga, Johan; Brown, Graham; Cooper, Alan (2018-08-06). "When did Homo sapiens first reach Southeast Asia and Sahul?". Proceedings of the National Academy of Sciences. 115 (34): 8482–8490. doi:10.1073/pnas.1808385115. ISSN 0027-8424. ^ Hayward, John A.; Johnston, Iain G.; May, Sally K.; Taçon, Paul S.C. (2018-03-15). "Memorialization and the Stencilled Rock Art of Mirarr Country, Northern Australia". Cambridge Archaeological Journal. 28 (3): 361–378. doi:10.1017/s095977431800015x. ISSN 0959-7743. ^ Miller, E. 2016 The Case for Baskets: Rock Paintings of Bags and Baskets in Western Arnhem Land, Australia. BA (Hons), The Australian National University, Canberra. ^ May, Sally K.; Wesley, Daryl; Goldhahn, Joakim; Litster, Mirani; Manera, Brad (2017-02-13). "Symbols of Power: The Firearm Paintings of Madjedbebe (Malakunanja II)". International Journal of Historical Archaeology. 21 (3): 690–707. doi:10.1007/s10761-017-0393-6. ISSN 1092-7697. This article relating to archaeology is a stub. You can help Wikipedia by expanding it.